There is certainly an increase in companies adopting BYOD (Bring Your Own device) policies. According to IT research firm, Gartner, 73 percent of small-to-medium businesses supported BYOD policies in 2013. And the research firm predicts that this number will jump to a whopping 90 percent by the close of 2014. Within three years, three quarters of corporate data breaches on mobile devices will stem from the misuse and misconfiguration of applications…Employees, not hackers, will be responsible for most of the losses. Left unchecked, the number of breaches will grow with the rise in mobile device use. And a CompTIA survey revealed that because of the discrepancy between how employees are accessing their company’s network and how IT thinks employees are doing this, Gartner’s predictions may not be too far off. The survey found that more than 70 percent of employees reported accessing the company network with a personal device; yet, just 37 percent of IT workers believe that workers are doing so. And while 88 percent of employees believe that their mobile device is secure, only 22 percent of IT workers feel the same. With the rise of BYOD in the workplace and the possible threats that can come with this policy if used improperly, now more than ever it is important for employers to educate their workers on the importance of not only keeping their information synchronized but secure. Whether companies are ready or not, the BYOD era is here to stay: Industry analyst Gartner identified device diversity and related management issues resulting from BYOD as a top strategic technology trend for 2014, noting that the challenges of managing multiple devices would continue to take a toll on IT departments. It’s important for HR professionals to be aware of the implications of BYOD – including the need to synchronize, backup and protect data across devices. Business success increasingly depends on access to accurate, current and complete data. Without it, it’s difficult for employees to collaborate efficiently or manage customer relationships effectively. Inaccurate data also makes it impossible for managers to make sound business decisions. To address this issue in the BYOD era, some business leaders put their faith in cloud storage solutions to keep data synchronized and protected. In theory, a central repository could ensure data completeness – provided that employees routinely sync devices. But in practice, more than half of business data is stored on employees’ desktops, laptops and devices. 1. File-based synchronization and backup solutions: With this approach, companies can enable automatic synchronization of files and folders across all platforms, including mobile devices, laptops, desktops, servers and even external hard drives. 2. Server solutions: With a server solution, companies can ensure server files are current while also maintaining easy access to data by saving files in their original format on servers for fast search and retrieval. Well-designed server solutions feature a sync function that enables user integration via Active Directory and Group Policy. 3. Management console solutions: This option allows companies to backup and synchronize enterprise data from a central web interface and create performance reports. It also enables IT to easily manage administrative permissions and users across multiple locations and streamlines sync job creation with grouping functions. 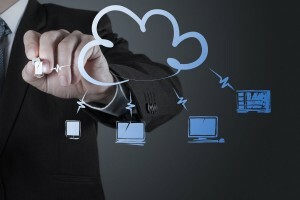 With the BYOD trend firmly established in the workplace and the utility of cloud solutions in eliminating data silos undermined by evidence that enterprise data is commonly stored on devices, business leaders who value accurate, up-to-date data will have to take steps to backup, sync and secure data at the enterprise level. There are a number of options available, and the correct solution depends on individual business needs. Business leaders who are looking for a way to make sure their company’s data is backed up, synced and secure should evaluate all of their options and make sure they select a solution that allows them to backup, sync and protect data across all types of devices – including employee-owned smartphones and tablets that are used for business purposes. They should also ensure that the solution they select has the added features they need, such as multiple site administration functions and report generation capabilities. Company leaders who choose the right backup, synchronization and security solution for their business can significantly reduce the risks posed by the BYOD trend. They can also improve their competitive position by enabling employees to access accurate, complete and up-to-date data that allows them to make the right business decisions.